Excitingly for the first time, social scientists were invited to take part in special dedicated session . Chaired by Professor Mark Wilson and Dr William Fisher, the session included six talks from speakers from academia and industry, including Modus Outcomes’ Stefan Cano and Thomas Salzberger (Table 1). Measurement can be defined as a quantitative comparison, made using one of more instruments, in a unit with expressed measurement uncertainty . Metrology, then, can be defined as “the science of measurement, embracing both experimental and theoretical determinations at any level of uncertainty in any field of science and technology” . Modern metrology dates back to the late eighteenth century through the efforts to harmonize units throughout France . The meter and subsequently the metric system were born, eventually leading to the International System of Units (SI) in 1960 . Today, most countries have national metrology institutes (NMI) and national measurement systems (NMS), which take the form of a network of laboratories, calibration facilities and accreditation bodies that implement and maintain its metrology infrastructure. Metrology is important because standardization of units is critical for measurements to be meaningful in linking human endeavors, including: economics, energy, environment, health, manufacturing, industry and consumer confidence . There are three broad types of metrology (Table 2), which all involve three cornerstone activities: the definition of internationally accepted units of measurement; the realization of these units of measurement in practice; and the application of chains of traceability (i.e., linking measurements to reference standards) . Metrology provides a framework for a common language of reference measurement systems, which in turn have the potential to improve the accuracy and comparability of data from different sources. However, we have yet to realize reconciliation between metrology in the physical sciences and measurement practices in the social sciences , despite the extensive and long running history of social measurement . However, in recent years this situation is beginning to change. This is exemplified by the commercially successful  scientific reading ability measurement framework , collaborations between metrology engineers and psychometricians , and new research being produced within national metrology institutes [22-25]. 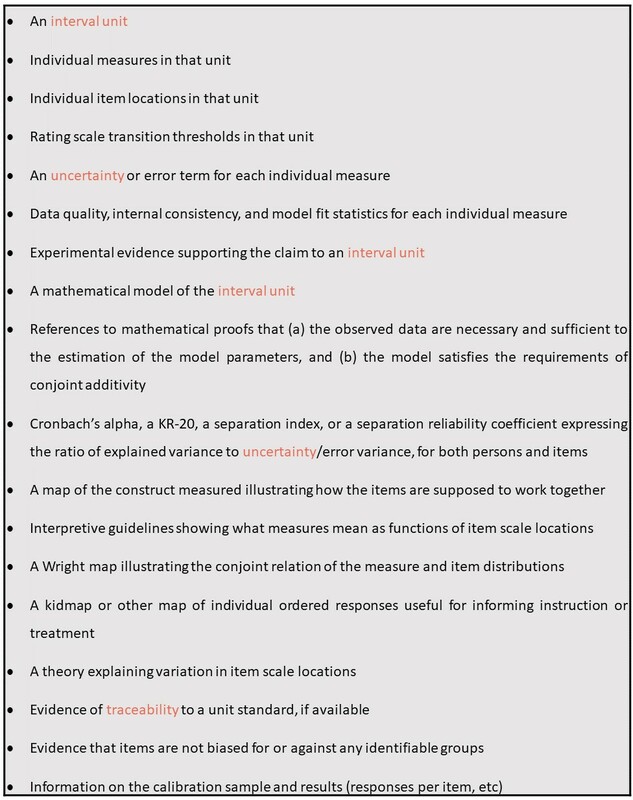 In a recent blog, William Fisher (a member of Modus Outcomes Scientific Advisory Group), offers a measurement quality checklist , which helps move us away from the ambiguity of psychometric statistics  and towards a fuller understanding of scales and tests social scientists like to call ‘instruments’ (Box 1). There are lots of possible reasons for the lack of recourse to formal metrological frameworks in the social sciences . But, at a time when Patient Centered Outcome Measures are being used in high stakes decision making across clinical research, trials and practice, we believe it essential that our instruments reach the highest possible scientific bar . As we have seen, the potential damage caused by not-fit-for-purpose scales can be profound  . Measurement in the social sciences currently resembles the problem that was measurement of temperature in the 17th Century . Reconciliation between metrology in the physical sciences and measurement in the social sciences can help to provide a resolution. We at Modus Outcomes will continue to pursue our collaborations with metrological researchers, societies, and national institutes to further support the case to move towards higher standards for measurement to ensure that potential benefit of new therapies is evaluated accurately and fairly. Thomson W. Popular Lectures and Addresses, Vol. I p.80. London: MacMillan; 1891. IMEKO. 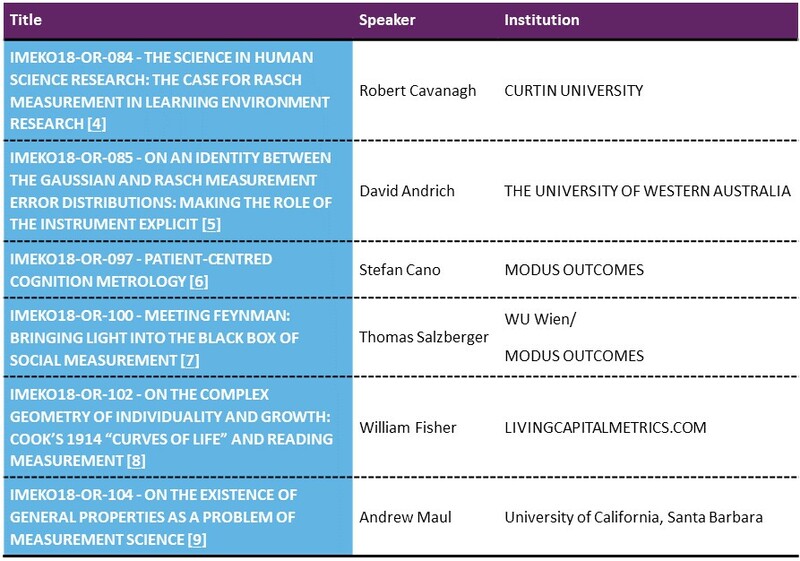 Measurement – Social Sciences TC7 Special Sessions. Goldsmith M. A Beginner’s Guide to Measurement. Teddington: National Physical Laboratory; 2010. Internation Bureau of Weight and Measures (Bureau International des Poids et Mesures). 2018. Kehlmann D. Measuring the World. London: Quercus; 2005. Crease R. World in the Balance: The Historic Quest for an Absolute System of Measurement. New York: WW Norton and Company; 2011. Slaev V, Chunovkina A, Mironovsky L. Metrology and Theory of Measurement (De Gruyter Studies in Mathematical Physics). Berlin: Walter de Gruyter; 2013. Czichos H, Smith L, eds. Springer Handbook of Metrology and Testing. New York: Springer; 2011. Vosk T, Emery A. Forensic Metrology: Scientific Measurement and Inference for Lawyers, Judges, and Criminalists. Boca Raton: Taylor & Francis Group; 2015. Cano S, Vosk T, Pendrill L, Stenner A. On Trial: the Compatibility of Measurement in the Physical and Social Sciences. Journal of Physics: Conference Series. 2016;772(2016):012025. Kempf-Leonard K. Encyclopedia of Social Measurement. Oxford: Elsevier; 2005. Fisher W, Stenner A. Theory-based metrological traceability in education: A reading measurement network. Measurement: Interdisciplinary Research and Perspectives. 2016;92:489-496. Mari L, Wilson M. An introduction to the Rasch measurement approach for metrologists. Measurement. 2014;51:315-327. Pendrill L. Man as a measurement instrument. NCSLi Measure: The Journal of Measurement Science. 2014;9(4):22-33. Pendrill L, W. P. Fisher J. Counting and quantification: Comparing psychometric and metrological perspectives on visual perceptions of number. Measurement. 2015;71:46-55. Pendrill L. Assuring measurement quality in personcentred healthcare. Meas Sci Technol. 2018;29(034003). EMPIR. EMPIR Project 15HLT04 NeuroMet 2016, Innovative measurements for improved diagnosis and management of neurodegenerative diseases. 2016-2019. Fisher W. Measurement quality checklist. Wright B. A history of social science and measurement. Educational measurement: issues and practice. 1997:16(4):33-45. Cano S, Pendrill L, Barbic S, Fisher W. Patient-Centred Outcome Metrology for Healthcare Decision-Making. Journal of Physics: Conference Series. 2018;1044:012057. Hobart JC, Cano SJ, Zajicek JP, Thompson AJ. Rating scales as outcome measures for clinical trials in neurology: problems, solutions, and recommendations. The Lancet Neurology. 2007;6(12):1094-1105. Morel T, Cano SJ. Measuring what matters to rare disease patients – reflections on the work by the IRDiRC taskforce on patient-centered outcome measures. Orphanet Journal of Rare Diseases. 2017;12(1). Chang H. Inventing Temperature: Measurement and Scientific Progress. Oxford: Oxford University Press; 2007.